Lake Tahoe is the largest alpine lake in North America and the second deepest lake in the United States after Crater Lake. Tahoe is the sixth largest lake in the country in volume, after the Great Lakes. The lake’s basin was formed by normal faulting resulting from vertical motions, which caused some blocks to be uplifted. These blocks created the Sierra Nevada range on the west of the basin and the Carson range on the east. The basin was formed by down-dropped blocks, also known as grabens. This is the same type of faulting is representative of the neighboring Great Basin as well. The Lake Tahoe Basin is the youngest of numerous extensional basins located in the Walker Lane deformation zone, accommodating approximately 12 mm/year dextral shear between the Sierra Nevada-Great Valley Block and Northern America. Lake Tahoe Basin is basically made up of 3 main faults. The East Tahoe Fault can be found on the basin’s eastern part. The West Tahoe Fault is located between Emerald Bay and Tahoe City. It is the local segment of the Sierra Nevada Fault, and it advances north of the two towns. The North Tahoe Fault lies between the two previous faults, on the northern side of Lake Tahoe. The most active and possibly most dangerous fault of the three is the West Tahoe Fault. Scientific studies suggest that the last earthquake in the area occurred some 4100-4500 years ago. Numerous high peaks surround the Lake Tahoe Basin, which were formed together with the basin. Some of the tallest are the Freel Peak (3320 m), Monument Peak (3068 m), Pyramid Peak (30243 m) and Mount Tallac (2967 m). The northern shore also has three summits which are higher than 3050 meters: Mount Rose, a very popular hiking and backcountry skiing destination, Peak Houghton and Relay Peak. The ancestor of today’s Lake Tahoe was created when the melting snow from the surrounding mountains filled the southern, lower part of Lake Tahoe Basin. Rain and runoff water also contributed to the formation of the lake. Tahoe’s modern form was shaped by scouring glaciers which occurred throughout the Ice Ages and began more than one million years ago. The soil found in the lake’s basin is mainly made up of andesitic volcanic rocks and granodiorite, with some small areas composed of metamorphic rocks. The bottoms of the valleys are covered in glacial moraines and some glacial outwashes. Scientists consider that because of the great depth of Lake Tahoe, as well as the position of the surrounding faults, earthquakes can surely cause tsunamis in the water, predicted to having heights between 3 and 10 meters. These waves would be able to travel from one end of the lake to the other in a matter of a few minutes. Studies show that the large collapse on the western edge of Lake Tahoe Basin (which led to the formation of McKinney Bay some 50,000 years ago) is thought to have generated a seiche wave which had a height of more than 100 meters. The freshwater Lake Tahoe is located along the border between California (owning 2/3rds of its shoreline) and Nevada, just west of Carson City. It is most famous for its clear waters and the surrounding landscape, making it a popular holiday destination. It is the 16th deepest lake in the World. More than 75% of Tahoe’s watershed is national forest land, and is actively protected by the United States Forest Service. The largest city on the lake’s shoreline is South Lake, adjoining the town of Stateline on the south, whilst Tahoe City can be found on the lake’s northwestern shore. Tahoe’s total watershed has a surface area of 1310 km2. The lake is fed by 63 rivers and streams, which drain an area about the same size as Lake Tahoe itself. 50% of the water income is due to rainfall and snowmelt. Despite the large number of tributaries, Lake Tahoe only has one outlet, Truckee River. It flows in the northeastern direction into Pyramid Lake in Nevada State, which doesn’t have any outlets. Only 1/3rd of the water leaves the lake through the Truckee River, the rest gets away via evaporation. The flow of the Truckee River, similarly to the height of Lake Tahoe, is both controlled by a dam located at the outlet of the lake. August is the warmest month in the Lake Tahoe Basin, with an average maximum temperature of 25.9OC, and an average minimum of 4.3OC. January is the coolest month, with an average maximum of 5OC and an average minimum of -9.4OC. The record-breaking, all-time maximum temperature was recorded on the 22nd of July 1988, measuring 37.2OC. The average minimum was measured on the 9th of December 1972, with -33.9OC. Although the summer months are warmer, freezing temperatures can be recorded each month of the year. The mean annual precipitation in the area is 1440 mm on the western part of Lake Tahoe Basin and 660 mm near the lake, on the east. Precipitations mainly come from snowmelt from November to April. Rainstorms and fast snowmelts usually cause large floods in the region. The annual runoff of snowmelt usually occurs late spring-early summer. In some years, the summertime monsoons from the Great Basin transport intense rainfall to the Lake Tahoe Basin, especially occurring at higher elevations. The vegetation in the lake basin consists mainly of a mixed coniferous forest, made up of Jeffrey pine, lodgepole pine and white and red fir. The area is also abundant in wet meadows and riparian areas, as well as brush fields along with rock outcrop areas at high elevations. The mount alder, which grows along many of the basin’s streams and rivers, is known for fixing nitrogen in great quantities. Lake Tahoe’s beaches are the only known habitat for the rare Lake Tahoe yellowcress, a plant which grows in wet sand between low and high water marks. In mid-autumn the mature kokanee salmon transform from a silver-blue color to a kind of vermilion and run up to Taylor Creek. When the spawning season is close-by, fish acquire a humpback and protuberant jaw. After the spawning season, the fish die and their carcasses serve as a fest for numerous animals, such as minks, bears and bald eagles. Salmon are not native to Lake Tahoe, but were brought in from the North Pacific in 1944. The North American beaver was reintroduced to the basin by the California Department of Fish and Wildlife and the United States Forest Service between 1934 and 1949. Lately the beavers have been seen around the lake, mostly at Tahoe Keys, Taylor Creek, Meeks Creek and Meeks Bay. A recent study affirmed that when a beaver dam is removed, it decreases wetland habitat, magnifies stream flow and the total phosphorous pollutants which enter the lake through these streams, contributing to the lake in a very negative manner. Because of the great depth and the cold temperature of Lake Tahoe, its waters are known to slow down the decomposition rate of organic matter. This was confirmed when a lost diver was found at a depth of 90 meters 17 years after his disappearance, in a nearly perfectly preserved state. 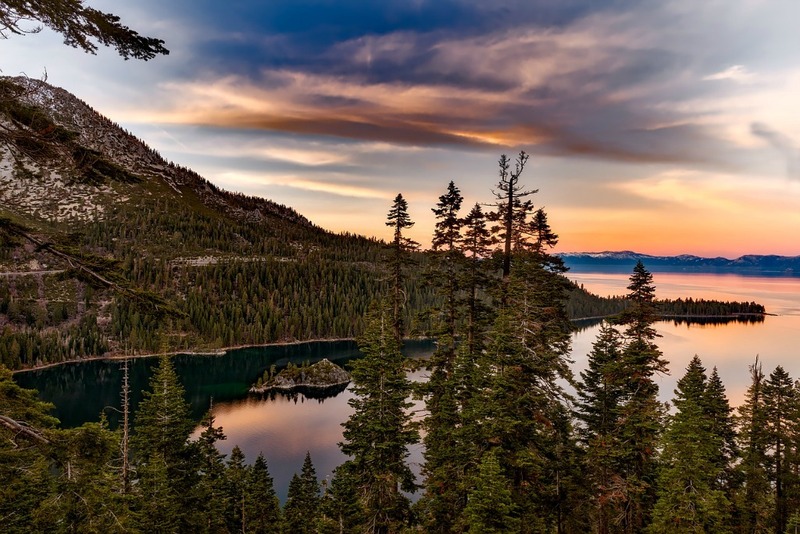 Although Lake Tahoe is known mostly for its beautifully clear waters, over the past years it has become increasingly eutrophic, despite the exportation of sewage and conscious land-use planning. It has been said that its clarity decreases and average 0.25 meters each year. Until the ‘80s nutrient-limitation studies have shown that the primary productivity in Lake Tahoe was limited by nitrogen. A half century later, when accelerated nitrogen input was cultivated, the lake has become phosphorous-limited. Urban stormwater runoffs represent more than 70% of the total sediment particle load which the lake receives. The urban uplands provide the opportunity to reduce the fine sediment particles and the phosphorous concentration to the lake. The lake’s historic clarity of 30 meters can be achieved with a reduction of 75% of waste coming from urban sources. 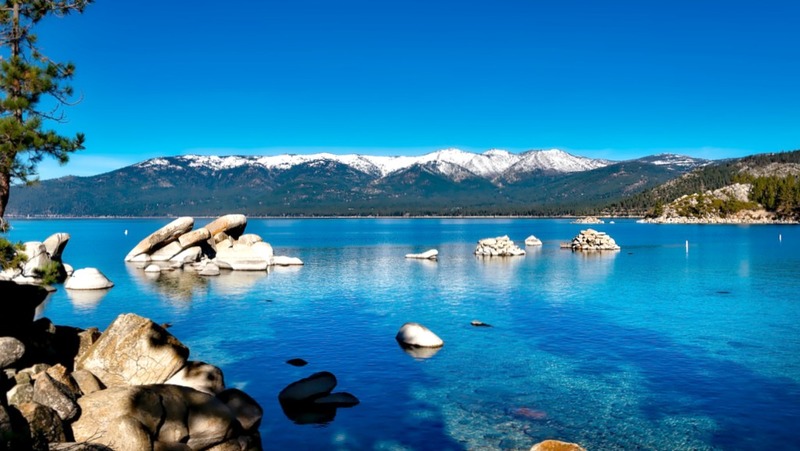 Studies have shown that Lake Tahoe’s clarity has improved between 2011 and 2013 by 10%. Lake Tahoe never actually freezes, and since the 1970’s it has mixed to a depth of at least 400 meters a total of 617 times. According to an examination, the lake has warmed at an average 0.015 degrees Celsius every year between 1969 and 2002. This was mainly caused by the increase of temperature and the increase of downward long-wave radiation. Significant changes have been observed in the lake’s food web and zooplankton population since the 1960s. Between 1963 and 1965 the opossum shrimp was introduced to Lake Tahoe, in attempt to enhance the food supply for the kokanee salmon, which was also an introduced species. The opossum shrimp was also an important food resource for the trout and would compete with juvenile fish for zooplankton. The shrimp began feeding on the cladocerans found in the lake, and managed to cause the disappearance of the species by 1971. Thanks to conservation efforts, the cladoceran population somewhat recovered in the lake since the incident. Since the Lake Tahoe area has become a very popular holiday destination, the number of constructions has increased in the region, which caused the clouding of the lake’s clear waters. The Tahoe Regional Planning Agency has come in aid of this problem and regulates construction zones in the area. The League to Save Lake Tahoe has been the true guardian angel of the lake for more than 50 years. It was founded in 1957 after a proposal was made to construct a four-lane highway around Lake Tahoe. The league has been preventing poor construction plans and environmentally unsafe projects ever since. The Lake Tahoe Interagency Monitoring Program has been measuring the stream discharge and nutrient and sediment concentration of the lake since the ‘80s. The data is usually checked by the Lahontan Regional Water Quality Control Board, who put together a plan limiting the flux of nutrients and sediment in Lake Tahoe. UC Davis is the main steward of the lake. The UC Davis Tahoe Environmental Research Center is dedicated to research projects, as well as educational and public outreach. Its main goal is providing scientific information to raise awareness in the sustainable use of Lake Tahoe Basin. They are the ones who write a detailed “State of Lake” assessment report each year. Lake Tahoe Basin was originally inhabited by the Washoe Native American Tribe. Lake Tahoe was actually the center of the Washoe Indian Territory, which included the upper valleys of Truckee River, Walker and Carson. The English name of the lake is said to originate from the Washoe word “da’aw”, meaning “lake”. The first European who reached the area was Lt. John C. Fremont, during his second exploratory expedition on the 14th of February 1841. The first white man to actually see the lake (Meeks Bay) from a peak was a Sierra explorer, John Calhoun Johnson, who named it Fallen Leaf Lake after his Indian guide. During his first job as a mailman, carrying mail from Placerville to Nevada City on snowshoes, he renamed it “Lake Bigler”, after the third governor of California, John Bigler. In 1853 the surveyor general of California, William Eddy, also referred to the lake as “Lake Bigler”. During the Civil War the Union advocated disagreed with the name because, John Bigler proved to be an ardent secessionist. Thus, the United States Department of the Interior gave the lake the name “Tahoe” in 1862. The name was only officially and finally designated as Lake Tahoe in 1945, and until then both names were frequently used for the lake. After a heavy dispute when gunshots were fired in 1864, the states of California and Nevada decided to define the partition of the lake. Following geographical coordinates, they mutually decided that they’d draw the state line at the middle of the lake. Unknown to them, California became the proprietor of 2/3 of the lake, whilst Nevada only got 1/3 of it. The California part is divided between Placer and El Dorado counties, whilst the Nevada side is split up between Washoe County, Douglas County and the independent Carson City. Due to a discovery of gold in South Fork of the American River in 1848 thousands of gold seekers passed the lake basin. In 1858 they discovered the Comstock Lode, a large silver deposit located a mere 24 kilometers east of the lake, in Virginia City, Nevada. Between 1858 and 1890 the logging industry became so popular and so extensive in the area that they almost cut down all of the native forest in the Lake Tahoe Basin. The basin’s tourist destination potential was recognized early, in the mining era. Tahoe City was founded in 1864 as a resort community for Virginia City. In the first half of the 20th century there a few vacation homes were set up around the lake. The real construction boom came after World War II, when gambling casinos were built in Nevada, while a few interstate highway links were also completed in preparation for the 1960 Winter Olympics. After this construction boom, the permanent residential population rose from 10,000 to 50,000 from 1960 to 1980, and the summer population grew to 90,000. The easiest way to reach the lake directly is by car. Tahoe is located merely 2 hours from the Sacramento area, 1 hour from Reno and half an hour’s drive from Carson City. The traffic can get heavy during weekends, and in the winter months snow tires and chains are necessary to reach Lake Tahoe, located at an elevation of 1879 meters. Most of the roads encircling Lake Tahoe are paved and have two lanes. The main routes are Interstate 80 via Truckee, US Route 50 and Nevada State Route 431 via Reno. Five major airports can be found in the region: Reno-Tahoe International Airport, Sacramento International Airport, Lake Tahoe Airport, Truckee-Tahoe Airport and Minden-Tahoe Airport. The Tahoe Basin can also be reached by train. The nearest passenger train service is at Amtrak station in Truckee, which has routes running from the San Francisco Bay Area to Chicago. Since the surrounding highways provide year-round access to the area, Lake Tahoe has been developed into a popular tourist destination which can be visited any time of the year. It is mainly popular from late spring until early fall, with two major cities identifying with tourist areas: South Lake Tahoe and Stateline. Smaller resort towns, such as Tahoe City and Kings Beach can be found on the north side. Some of the most popular summer activities are parasailing, jet-skiing and eco-friendly paddle sports like kayaking and canoeing. Boating is similarly a frequented sport, mainly because the lake hosts the most prestigious wooden boat show in the country, the Lake Tahoe Concours d’Elegance, held every August. Numerous lakefront restaurants await tourists and locals alike, equipped with docks and buoys. Sailboat racing, firework shows and guided cruises also represent popular summer pastimes. Scuba diving in the area is only recommended to advanced divers due to the increased risk of decompression sickness while diving at high altitude. Despite this, the sport is still popular, since it offers some dramatic drop-offs and wall dives. Meeks Bay Beach, Sandy Beach and Sand Harbor represent the most popular beaches in the Lake Tahoe area. Hot springs and spas also await visitors in search of some rest and relaxation. Such facilities include the Incline Village Recreation Center and the Steamboat Hot Springs Healing Center and Spa. Marinas represent great refueling spots as well as starting points for river cruises. Besides the numerous watersports activities, other outdoor activities such as hiking and cycling are also fun pastimes. There are a wide range of hiking and biking routes varying in length, difficulty and popularity. 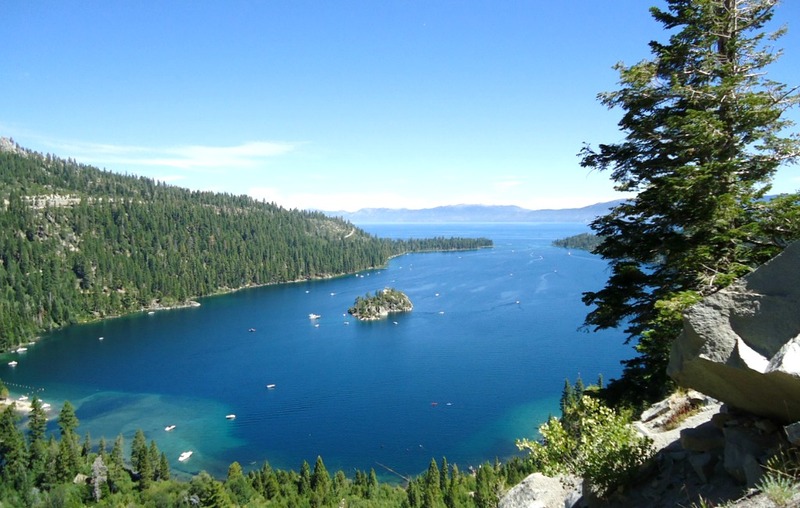 One of the most popular trails is the Tahoe Rim Trail, of a length of 270 kilometers, encircling the entire lake. Granite Chief Wilderness is located west of the lake, offering great hiking routes and wilderness camping opportunities. Desolation Wilderness is located southwest of the lake. Flume Trail on the eastern shore of the lake ranked number 1 at Mountain Biking Magazine’s Top 10 Trails in the United States of America. There are also numerous paved off-road cycle paths that encircle through small communities on both sides of the lake. Some of the most famous campgrouds are the Mount Rose Campsite, Alder Creek Campsite and Lake Forest Boat Ramp and Campground. Hot air ballooning, golfing and horse riding are also beloved. During the winter ski season thousands gather around, coming from Reno, Las Vegas, Los Angeles, San Diego, San Francisco and the Sacramento area. Squaw Valley, Alpine Meadows, Diamond Peak, Northstar at Tahoe and Heavenly Mountain Resort are some of the major ski areas, with the latter being the largest ski area in the states of California and Nevada. Public and private sled parks are scattered around Lake Tahoe, of which some are even equipped with rope rows to help sledders move up the hill. Snowmobile riding, snowshoeing and cross-country skiing are also popular activities in the area. Gambling is legal on the Nevada side of the lake, which has been developed with a number of large casinos with slot machines and table games. Although gambling in the state of Nevada only became legalized in 1931, the first casino had already been up and running for four years. Calneva Cabin, one of the oldest casinos in the country, was so popular, that even the renowned singer Frank Sinatra owned it in the 1960s and managed to sell it at the height of the region’s popularity. Other popular casinos are the Crystal Bay Club, the Tahoe Baltimore and the Nugget on the north shore, and the Lakeside Inn, Harvey’s, Montbleu, and the Hard Rock Hotel and Casino on the south shore. The lake area is home to many palatial homes of historical significance dating back to the 19th and 20th century. Thunderbird Lodge was constructed by George Wittel Jr. Vikingsholm, the original settlement on Emerald Bay includes an island treehouse and a 38-room home. The Ehrman Mansion used to be a summer residence, is now a state park, but it was constructed by the former Wells Fargo President in Sugar Pine Point. The Lake Tahoe Historical Society Museum, Tahoe Maritime Museum, the Watson Cabin Museum, the Olympic Museum, the UC Davis Tahoe Science Center, and the Terry Lee Wells Nevada Discovery Museum are some of the most visited cultural sites in the area.